I've just been handed a 2-week old baby canary who was separated from his mother yesterday because she was pecking him and wouldn't feed him. Since then he's not eaten or drank and has been exposed to room temperature. He's cold and listless, eyes closed, looks dehydrated, and his breathing is very fast and shallow. He hasn't pooped for hours. I've put him on a heating pad and will give him electrolytes as soon as his temperature has stabilised. If that works, I will give him some formula next (with an eye dropper? ), but I don't know how much and how often to feed him, or whether he will need medicating. PS. I've posted the above in another forum as well -- please don't take it as a slight, it's just a desperate emergency. 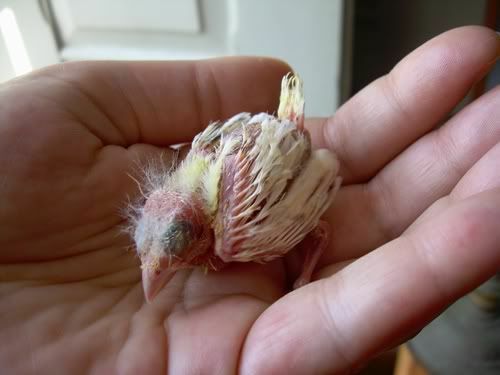 I have never fed a baby Canary before but I would suggest doing much the same as you would a baby pigeon at that age. If the mother was pecking it she mostly hasn't been feeding it so I would start with eletrolytes mixed with a handfeeding diet, very,very runny & just a tiny bit at a time. Teresa...........I have nothing to add to what Robin has already advised. The situation for this baby sounds so very critical. I would just like to send positive healing thoughts and prayers your way. Teresa... I agree with Robin and Louise...the baby should be fed until his crop is about 3/4 full. Once it empties...feed him again. Canaries don't hold as much food as pigeons do and they process it much more quickly and you will need to fed whenever the crop is empty. I can't say what medications you should give him or if any since we don't know why mom stopped feeding . 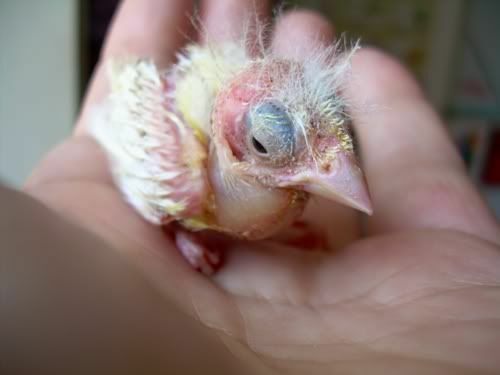 * I've just been handed a 2-week old baby canary who was separated from his mother yesterday because she was pecking him and wouldn't feed him. PS. ** I've posted the above in another forum as well -- please don't take it as a slight, it's just a desperate emergency. I am sorry to hear about the little canary, Teresa. Sending positive thoughts to you both. ** Absolutely not! I hope your other contact will be of assistance to you. I've done what you suggested and that's kept him going. I haven't tried tube-feeding him as my equipment is too big, but rubbing one drop of electrolytes at a time against his beak works, he drinks it. After he's drunk, he has opened his beak enough to put some runny formula, one tiny drop at a time, inside the tip of his beak. Then he closes it and swallows. His breathing isn't quite as fast now, and he's even managed some poop-looking poops. But he's far from being out of danger -- his left foot is broken, and I don't know what other horrors I may find yet. I'm ashamed to admit this, but the poor little thing belongs to my sister-in-law. She's wealthy and she's a pharmacist. Charis may remember my asking for advice about a canary that was unwell -- it was the baby's father. He appeared to have a GI tract infection and had stopped singing. Instead of chosing an appropriate antibiotic and taling him to the vet asap, she went to the pet shop and bought meds for ornithosis and a female canary. ("Cause if he wasn't singing he must have been sad and lonely.") So the baby may have been ill from birth. * I saw the results... she had dried blood on her face. I sent her to the chemist's to get hydrogen peroxide and q-tips to disinfect the peck wounds. If she's not done it by tomorrow, I'm keeping all three. Or boxing her ears. Or both. Teresa.........I am so happy to hear that the little one is starting to rally. I really think that by keeping her warm, offering small amounts of hydration and nutrition with the formula you should be able to stabalize the little one. As far as your sister-in-law is concerned, I have one just like that You rescued this little one just in the nick of time. You are propably wise to just keep all three birds. If your sister-in-law is aything like mine, I wouldn't trust her with any animal. I think you're right! Why do emergencies always happen on closing day?! The video is so sweet . Thanks for sharing it. When you feel the time is right Teresa, I would love to see a picture of your little canary. Your're right Teresa........most of all my rescues I have found on the weekends here when Dr. Hauck's office is closed. Yes I do remember about you asking me about his dad, Teresa. I'm so glad he's still alive. I've been wondering and hoping for the best all day. The youtube videos are great. 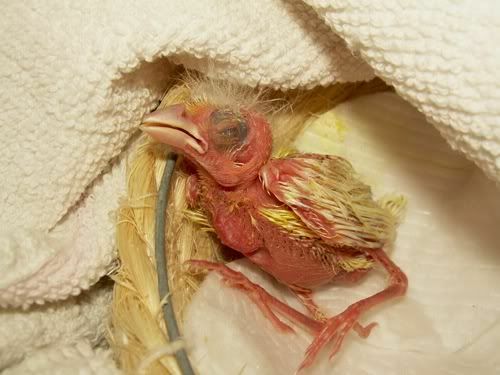 I never tube a baby bird as I have not found it necessary unless they are very sick. Sounds like your sister in law shouldn't have birds, at least that's what I'm thinking after what you told us. He's just had a really good meal and... opened one eye, just briefly! I made him a 'spoon' from a piece of drinking straw cut lengthways and with the end bevelled. I've got some pics and videos, but it's very late to upload them now, as I'll have to get up for work in 5 hours' time. Charis, you're right about my sister-in-law. She should stick to fluffy toys. I'm so glad the little one is hanging in there, Teresa. * He's just had a really good meal and... opened one eye, just briefly! ** I've got some pics and videos, but it's very late to upload them now, as I'll have to get up for work in 5 hours' time. ** We will be looking forward to seeing your pictures and videos when time permits. Those are great videos. Looking forward to seeing your baby. Teresa......The video from Saturday is pitiful to watch. You really did get this baby just in the nick of time. Precious little bird. I'm so gald he is improving. Teresa I'm so very glad the baby is getting better! Love the videos & photos please keep posting new ones. It hurt just to watch that video. Hope he keeps improving. Oh my goodness!! Such a little guy. Bless his and your heart, Teresa. Sending you both the most positive thoughts and get well wishes I can muster. Your good wishes are paying off! The vet was very happy with his progress. She tested his legs and feet -- they have sensitivity and some strength, so wait and see. She said any splint we could devise for his toes would be too heavy for him, as he's soooo tiny! I've called him Xi-ri (pronounced 'shee-ree', which is the sound he makes! Baby is improving rapidly! He now has both eyes open and peeps enthusiastically for food.